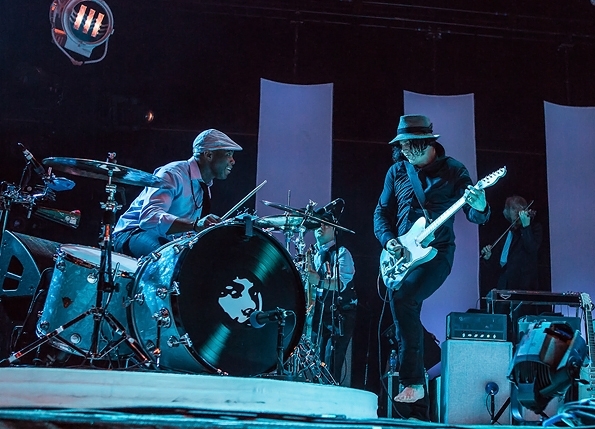 the Firefly Music Festival/Jack White live!! A week ago this time we had just finished getting our minds blown by Fitz & the Tantrums at the Firefly Music Festival in Dover, DE. Easily the best live show I’ve ever seen. While they mostly stuck to 2010’s Pickin’ Up The Pieces, they also covered The Raconteurs’ Steady As She Goes and Eurythmics’ Sweet Dreams. The crowd was more than pleased. Fitz (Michael Fitzpatrick) crowd surfed and their co-songwriter and co-lead singer of the band, Noelle Scaggs, (who also acted as emcee (MC)) had an unbelievable vocal and stage performance. When I first heard about this band a year or so ago, I also heard that they’re an incredible live show. And that it was even more incredible because they performed with out a guitarist. Which is true. Keyboard, sax, flute, bass, drums, and two incredible vocalists. Guitar credits aren’t even listed on their record. You never thought a band could do so much with so little. They have a terrific web presence and tweet photos from the stage that they take themselves. Over at their website you can download, for free, their two live EPs. We’re expecting their sophomore record from them sometime this year. I’m elated and having a hard time waiting. I also want to talk about seeing Cake live. John McCrea’s preaching about putting down your phone, his basic distaste for government and the establishment sometimes stole the show. But they’re such a great live band it didn’t matter that he was making snide comments about Facebook and the Man. McCrea stuck to the acoustic guitar and they played a surprising amount from their newest record, Showroom of Compassion, that came out January of last year. McCrea is one of the most underrated frontmen of rock and roll. He’s animated, articulate and exactly what he needs to be: entertaining. But the spell of the band’s longtime trumpet player, Vince DiFiore (who is the only other original member aside from McCrea) is like a swoon that washes over the crowd. DiFiore jumps in like a backup vocalist supplying the band with that big band, ska, mariachi sound that they’re famous for (well, that and the vibraslap.) Overall, see Cake live at any venue because they will not disappoint. I learned a lot of lessons at this festival: when there are over 5,000 (and later 10 and 20,000) people at an outdoor venue you have a hard time getting close, not getting elbowed and a hard time moving your arms. I know that 20,000 people is too many for me to watch live music. I also learned that unless the lineup is too incredible to pass up, that I probably won’t attend another music festival again. But the biggest lesson I learned was that Jesus Christ is alive and well. And his name is Jack White. He was the first night’s headliner. And while I feel the need to address the horrible sound mixing and crappy sound problems that terrorized his set (and that frequented the main stage all weekend) I am grateful to say that that hasn’t been my lasting impression. I have vivd memories from this live show. I can close my eyes and be there. I can’t believe this very blog post isn’t a love letter to Jack White and his band members. His live show, shoddy set up aside (granted, it was raining the whole set – which could’ve been the problem (?) Either way he looked like even more of a badass, as he took off his shoes and played barefoot to prevent all the sliding around) was the greatest rock and roll show I’ve ever been to. Rock and roll is Jack White. And anyone who has ever complained about him or the White Stripes have not listened to a live record of his or of theirs. I tell you this. Go see him live. It takes a dummy not to be impressed. While the show was going on I was distracted. I couldn’t help but think to myself that he was livid over the poor sound qualities and I wanted him to stop and fix the engineering problem before he continued. (I did come to a conclusion: the fact that they never did a live sound check with any of the headlining bands. A good sound engineer knows that a real sound check is the full band playing at least one whole song all the way through at full volume. Read: it’s called college.) But that isn’t applicable with 5,000 people present. Clearly the poor sound situation is swirling through my brain. And it was during the whole show. But I can’t ignore Jack White and the memories I have of seeing him perform in person. Trash Tongue Talker might be my favorite track off his record and my favorite track of the year. Any time I hear it I stop what I’m doing and fall victim to it. While he’s known as an incredible guitarist I guess I’ve never had the chance to realize what an incredible piano player White is. The two pianos were set up with him and the man playing rhodes with their backs to each other. But they had mirrors propped up on the pianos to keep eye contact. It’s the little things like that that make you aware of the detail that goes into his live show. Between electric and upright bass, steel slide guitar and a key player, Jack and the drummer (who also had the traits of the best jazz drummer in Nashville) had incredible chemistry. White conducting the band, he was their key member. He sang and he was the stage. White’s musicianship is so marvelous. There is no one else like him. Up next he’s playing sold out Lollapalooza and he also sold out Red Rocks in Colorado. Only in the U.S. for a couple more weeks and then abroad, I am counting down the days until I get to see him live again. I regret not traveling up to see him when he played two nights at the Roseland Ballroom in NYC a couple months ago. I want to drop out of life to see him play at the Outside Lands Festival in San Francisco in two weeks. And I want to quit my job to follow him around Europe in the upcoming months. Until I can manage any of that I’ll have to stick to Lollapalooza’s live webcast of the whole weekend. 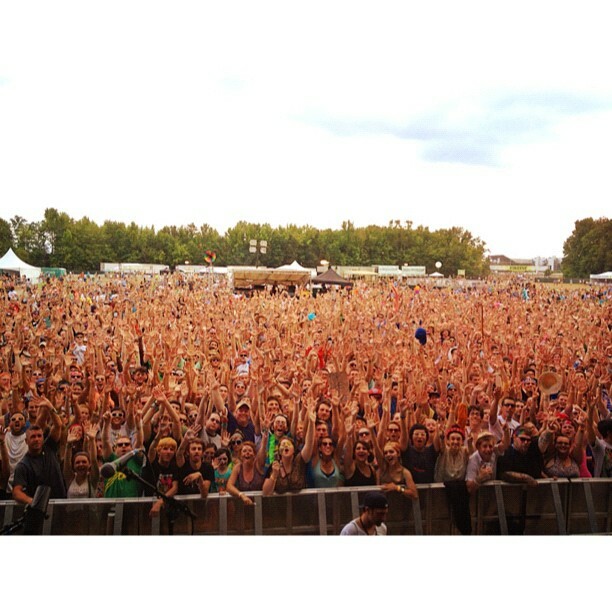 Firefly was a great festival. They had an incredible line up including The Black Keys, The Flaming Lips, (if you like them) The Killers, Modest Mouse, the Wallflowers, Girl Talk, Lupe Fisaco, John Legend, Cold War Kids, Grouplove and the list goes on. I learned a lot and we learned a lot about each other. Jack White is probably taking the cake for my record of the year (premature? Yes. Are you surprised? No.) and I’ve been listening to the record over and over. No need to fast forward. I ordered it on vinyl from Third Man Records (it arrived two days later. His recording in analog DOES pay off) and I signed up for the Premium Membership to the Third Man Records vault. The first package I’ll receive includes this. (Sign up for this quarter is good until the 31st, Tuesday!) I downloaded old White Stripes live records and have become a woman obsessed. So thank you, Firefly. I have become enlightened. I think my next trip is to Nashville.